This tour holiday and travel package have been designed specifically to focus on and to increase your chance to see the Great Serengeti Wildebeest Migration. 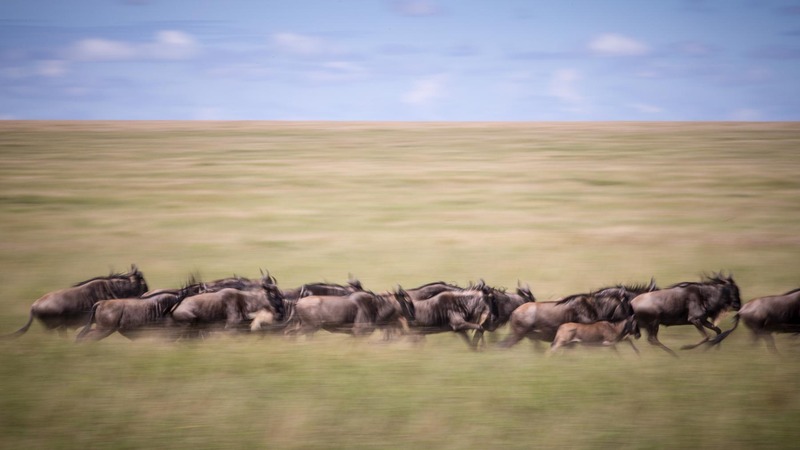 The Southern Serengeti and Ndutu areas in Tanzania are the best locations for the months of January, February and March to witness thousands of wildebeest spread across the plains grazing on the rich short grass plains. Predator action is at its peak with great sightings of cheetah, lion, hyena and leopard and a very good chance to see adrenalin packed kills. Our guide we’ll pick you up from KIlimanjaro International Airport and drive you to the hotel in Arusha for the overnight stay in Mount Meru Hotel. After breakfast, we’ll depart for Lake Manyara National Park for an afternoon and evening game drive. Manyara provides the perfect introduction to Tanzania’s birdlife. More than 400 species have been recorded, and even a first-time visitor to Africa might reasonably expect to observe 100 of these in one day. Inland of the floodplain, a narrow belt of acacia woodland is the favored haunt of Manyara’s legendary tree-climbing lions and impressively tusked elephants. overnight to Kirurumu Manyara Lodge. After breakfast, we’ll depart for Ndutu Area situated in the Ngorongoro conservation area, part of the southern Serengeti eco-system. Lake Ndutu is alkaline, like most of the other Rift lakes, however, the water is still drinkable and used by a wide array of local wildlife. We’ll have a late afternoon game drive in the Ndutu area. The majority of the wildebeest migration can normally be found on the short-grass plains from December to April. The area is usually heavily populated with elephant, birds and resident game. Dinner and overnight as per the standard and type of accommodation at Acacia Migration Camp. After breakfast, enjoy a full day game drive in the Ndutu area. Explore the range of different habitats that include swamps, woodland, soda lakes and the world famous Serengeti short grass plains. See great herds of wildebeest and zebra. During a short time frame around February, normally lasting for about 3 weeks, the majority of the wildebeest calves. The sea of grass provides little cover and the young are easy pickings for a variety of predators. Wildebeest calves can run minutes after they are born and within 3 days they are normally strong enough to keep up with the herd. Lunch, Dinner and overnight at Acacia Migration Camp. After breakfast, we head towards the central Serengeti National Park, also known as the Seronera. We descend into the heart of wild Africa – the Serengeti National Park – with its endless plains, rolling into the distance as far as the eye can see. We head to the Seronera area, one of the richest wildlife habitats in the park, featuring the Seronera River, which provides a valuable water source to this area and therefore attracts wildlife well representative of most of the Serengeti’s species. We arrive in time for lunch and enjoy an afternoon game drive in the Serengeti national park. Dinner and overnight in the Seronera area, Serengeti Acacia Luxury Camp. Early departure 6:00 am. After breakfast, drive to Ngorongoro Conservation Area. Descend over 600 meters into the crater to view wildlife for a half day crater tour. Supported by a year round water supply and fodder, the Ngorongoro National Park supports a vast variety of animals, which include herds of wildebeest, zebra, buffalo, eland, warthog, hippo, and giant African elephants. Another big draw card to this picturesque park is its dense population of predators, which include lions, hyenas, jackals, cheetahs and the ever-elusive leopard, which sometimes requires a trained eye to spot. We will visit Lake Magadi, a large but shallow alkaline lake in the south western corner, which is one of the main features of the crater. A large number of flamingos, hippos and other water birds can usually be seen. Dinner and overnight at Ngorongoro Farm House Lodge. Pick up from your lodge after breakfast and meet your driver guide then proceed to Tarangire National Park for a full day game drive with picnic lunch. This is the third largest park in Tanzania and it is characterized by the amazingly large herds of elephants that can be encountered in this park. Dinner and overnight dinner and overnight at Tarangire Maromboi Tented Lodge.